spilledpolish: Happy Birthday Kaitlyn (@pawlished.kait)! A couple of us girls came together and did our nails for Kaitlyn's birthday today! I decided to recreate a design she did months ago.. back in December! Click HERE to see the original. I painted all my nails with one thick coat of Beyond the Nail - Cornflower Blue Creme. 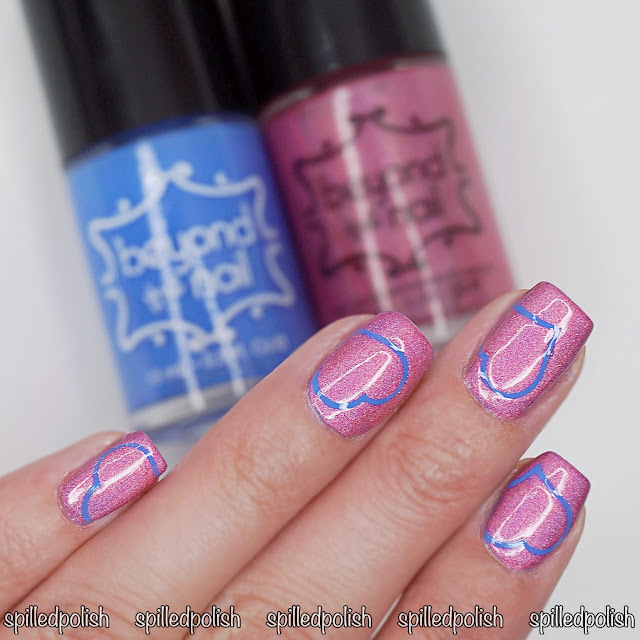 When it was fully dried, I placed on a Heart Nail Guide from Beyond the Nail's Nested Basic Shape Nail Guides. I painted over each nail with Beyond the Nail - Nebula, then immediately peeled off each nail guide to get crisp lines. I added one coat of PRO-FX - Quick Dry Topcoat to each nail to finish off the look.